Collecting is such an individual and personal experience: to some it's decorative, for others it's investment and still others, simple enjoyment. My wife and I collect because the vision and personal beauty of others work wakes us up to the world and creates a life heightening experience. A major collector once told me, “There is a difference between a collection and an accumulation.” Some may consider the distinction between acquiring and collecting to be a subtle one at best. I don't – I'm guessing most folks who chose to buy a Hopper or a Picasso weren't going with something to match the couch: They were buying an artists vision. One can simply look at art or they can witness it. Witnessing art is soul touching. I have had it happen while experiencing the great works of Michelangelo, Corot and Issac Levitan. In those experiences I realized that art can be so much more. Things so deeply felt and beautifully stated that the craft disappears, and one is met only with emotion. Studying the work of these mature artists, who had nothing left to prove, simply showing the world what they loved, changed me. I now realize that painting for any other reason than love and desire to express it, is a waste of my time. To feel more intensely and see more deeply and let the beauty of that carry the visual experience is enough. This is why almost all of my work is done from life – life being the key word. The more senses I engage in the process of creating a painting – the richer the experience for the receptive viewer. A direct correspondence with nature affords me the opportunity for clarity and economy, and encourages risk. In those moments of risk there is a letting go – an unselfconscious connection, served by years of discipline and understanding. That risk and the necessary speed required, allows for the possibility of a “felt” mark, and a painting that has an exhale to it. Every painting should be separate and distinct – a full, sensory record of a specific mood, time, and place. Most of my paintings are brought to 90% completion or better in the field but I don't attempt to finish them there. Often the subjective, nuanced choices take days of quiet and thoughtful deliberation. I let the painting tell me what it needs. I believe this combination of the intense, decisive approach to working from life combined with thoughtful decision-making creates the possibility for a more personal statement. I don't churn out work or create "product," but endeavor to make art. Every painting, large or small requires the same care and consideration. The nature of my approach limits the amount of work I can create. No matter how good a photo of a painting is, it can never transmit the feeling an artist imbues it with. Art painted from life is best viewed that way. If at all possible visit my studio or one of my galleries to experience the work in person. Connection through experience is the most rewarding. I think good work has away of finding a good home. Yet, purchasing a work of art is no small thing. You need to live with it; you should love it. Buying it because you wish to have it around you is the best reason to own it. The thrill and appreciation of my work finding a good home has never lessened. Thank you to all those collectors, past, present and future. None of us do this without you. I was first introduced to the paintings of Joe Paquet some 20 years ago. There are so many factors that attract one to a painting, but what I noticed right away was an exceptional ability to draw. Elements of perspective, placement, and relevance are united with a great understanding and thoughtful use of color and careful brushwork. Combining these qualities with consistency demonstrates Joe's comfort with his creative ability and exceptional talent. One can walk into a room and immediately recognize a Paquet painting. Joe has spent years studying art history. He has undoubtedly been influenced by past masters as well as by the art of many of his contemporaries. Aspects of their works have subtlety been absorbed into his style of painting and those paintings continue to enrich my life. I spent some time on your website in the past few days and I am so impressed. You are working in a genre that so often can be flashy or plodding but your work is impelled by a poetic spirit that achieves an off center and very personal beauty. The choices of how you see your subject are always subtly surprising and your touch finds a satisfying faithfulness to the subject but with some poetry in the color and light atmosphere that separates the work from photographic realism. The beauty of your paintings is hard to pin down and that elusiveness is always the hallmark of great art. You mention Morandi as an influence and I think you really have understood the kind of deep contemplation that his work embodies. My congratulations on what you have achieved and the life of the artist that you have successfully followed. For the past 8 years or so, I have had the pleasure of collecting Joe's work. There is technical excellence, absolutely, but I purchase his work because it "moves me." From the steamy reverie of a taconite mill in Duluth, to the pristine, serene silence of a Wisconsin farm in winter to the St. Paul neighborhood with whimsy... these wonderful works of art emit real feelings. They come off the canvas and speak to me. Priceless. I love Joe's work. 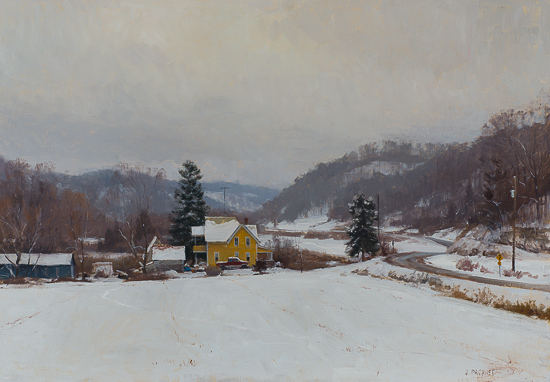 Joe Paquet is a towering figure in the field of landscape painting. His style is very thought-provoking: it takes more than a first glance to appreciate the subtlety that carries his work. Like a fine wine, his work owes itself to you upon further examination. Then it hits you like a hammer! I see many contrived, mechanical, "pretty" pictures out there. Joe's paintings are created with soulful beauty in every stroke. This is clear in all of his work regardless of scale. Artists like Joe don't come around often — He is a true artist in the highest sense of the word. This is the highest praise I can bestow. I have known Joe for several years and have been fortunate to acquire numerous paintings. He is a remarkable man indeed. Our attraction to Joe's work has primarily been his industrial subjects. In looking at his rail and industrial paintings one immediately sees that they represent the reality of the work; the grit, grime and wear and tear of that existence. His paintings are rarely action oriented and often depict the day beginning or a sense of rest and relief at days end. Usually with this type of work one feels the noise, turbulence and chaos of the daily routine but with Joe's work there is a sense of quiet, yet the anticipation that it may soon change. There is a quiet beauty and pent-up energy in these paintings which almost seems at odds with one another. But in reality they are partners in conveying his story. We collect Joe's work because of the incredible attention to detail and truthful representation of these rail and industrial sites.